Home / Just me! / Blog? Or mom? What would YOU choose? You know your life has gone beyond crazy when the only time you can sit down peacefully for half an hour is 35,000 feet up in the air. I don’t know what Michael Douglas was wailing about… give me an airplane journey any day, the longer the better. As frequently as you can. Not only because I love travelling but also because this has to be the least distracting workplace ever. If you can just ignore the siren call of inflight entertainment (for which you need to avoid Virgin Atlantic, since they have the very best movie selection in the skies!). For instance, these 8 hours from London to New York are utter bliss, with no phone calls and nowhere to dash about. Which is why my first post in almost a month comes from Seat 3A on flight VS003. For all those who’ve been asking about the silence, my mom was rushed in for a triple stomach surgery a month back and life came to a standstill. You know how moms are, right? Turns out she was living through the most gruesome pain for more than a month till it became beyond bearable and then had to undergo emergency surgery. I remember being this scared only once before in my entire life: When we had to make a similar dash to another hospital in another city after she had a heart attack. Mom’s supposed to be the strong one, the one who keeps us going. Holding her hand through a night of pain that couldn’t be mitigated even by the strongest injections medical science has to offer was heartbreaking. So is the fact that she’s only allowed liquids for the third week in a row now. My last couple of weeks have been spent blending veggies in the Vitamix and straining tomatoes and spinach into clear concoctions. Finally, tomorrow (fingers crossed!) she moves onto semi-solids, which is a relief by sheer comparison. And that’s why I’ve had neither the time nor the mental or physical energy to as much as craft a sentence for this past month. And I don’t regret it because I would happily go like this for another decade if it just means that mom is smiling and back to her old cheerful self. 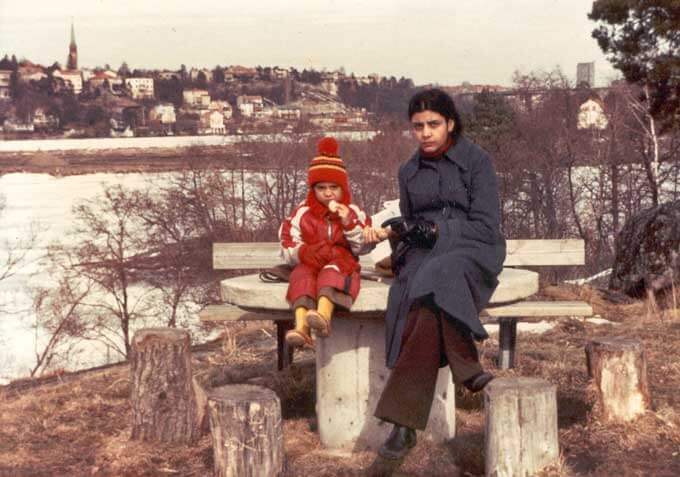 Mom & me… in another decade! And this airplane journey, ironically, is the only one in years that I would have happily skipped – because it means being half a world away from the parents right now. Ultimately, I was emotionally blackmailed into going by the very same mom, who threatened to give up food and medicines if I skipped what is the world’s most important blogging conference. BlogHer, as it’s known, is where online ninjas from across the world unite – this time in New York – to work with a diverse cast of experts ranging from Gwyneth Paltrow (Goop.com) and Christy Turlington Burns (Everymothercounts.org) to Melinda Gates and Ava DuVernay. It’s going to be an intense four days of geeking out over SEOs and personal branding and better headlines (I definitely need that one!) but I promise to come back better and stronger after it’s all done and dusted. Till then, please bear with my long drawn silences and continue to send mom all the healing energies. Wow! That’s terrifying. Yes, you totally needed to be with your mom as that’s WAY MORE important than being online at all times. I think we in today’s society have set such unrealistic expectations that when life throws a crazy moment in your face we really have to take the time to pay attention. Hope your mom recovers soon and have fun at your conference! Hope all is well with your mom, and with you, my prayers for you both…. Enjoy this time in the blogging conference…. *sends good vibes* Hope your mom heals back to her regular self, with you aiding her recovery she’s golden. Moms are the strong one! Wishing your mom better health. 🙂 And do update us on how the conference was.